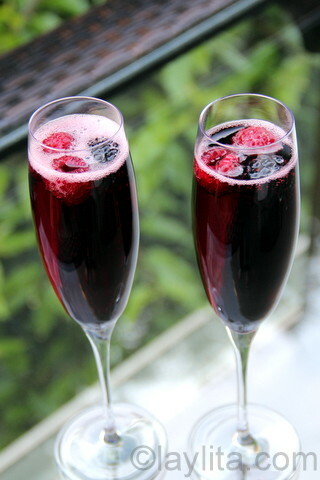 A kir royal, also called kir royale, is a classic french sparkling cocktail or aperitif made with champagne and blackcurrant liqueur. 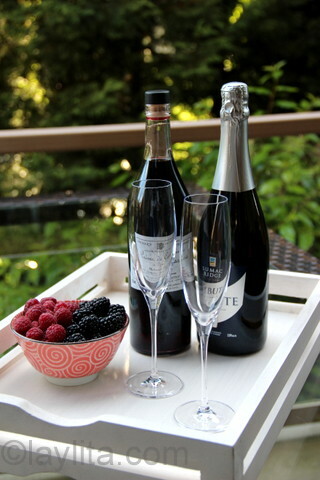 A simple kir is really just chilled white wine mixed with fruit or berry liqueur. 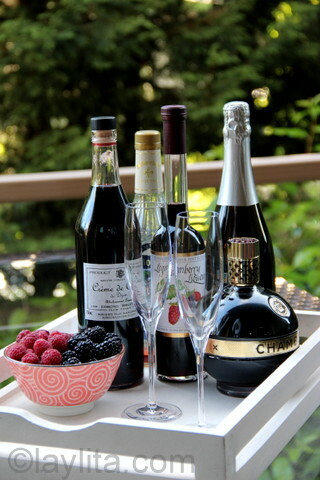 The most popular fruit liqueur used to make a kir is called crème de cassis or blackcurrant liqueur. 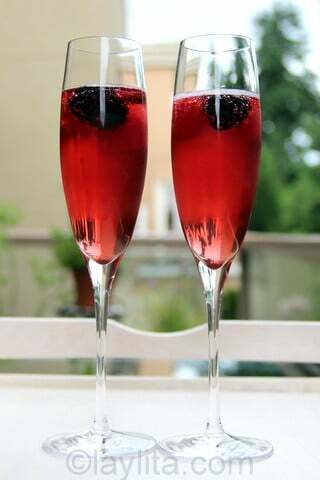 There are many variations of kir recipes; they can be made with raspberry liqueur, pomegranate, peach, melon and more. I’ve even had a kir with violet liqueur in the French Alps. 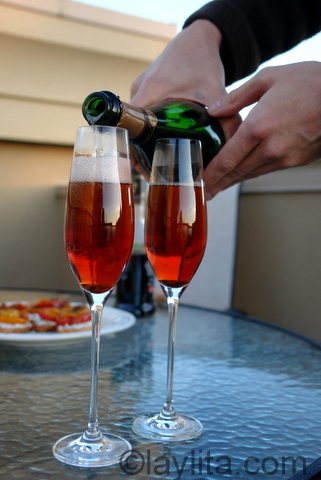 A kir royal is a kir made with champagne instead of white wine. It used to hard to find crème de cassis in the US, but now you can find at most liquor stores or supermarkets that sell liquors. Depending on where you live you can also find local liqueurs made with berries, these work great for preparing a kir royal. 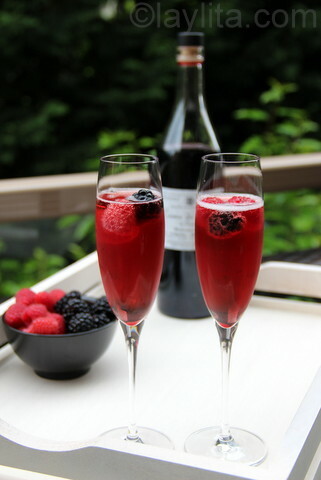 I also like to garnish the drink with some fresh berries. 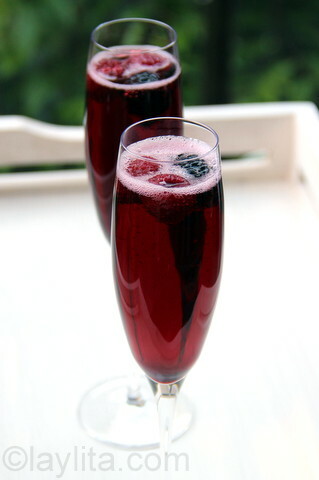 A kir royal, also called kir royale, is a classic french sparkling cocktail or aperitif made with champagne and blackcurrant liqueur. 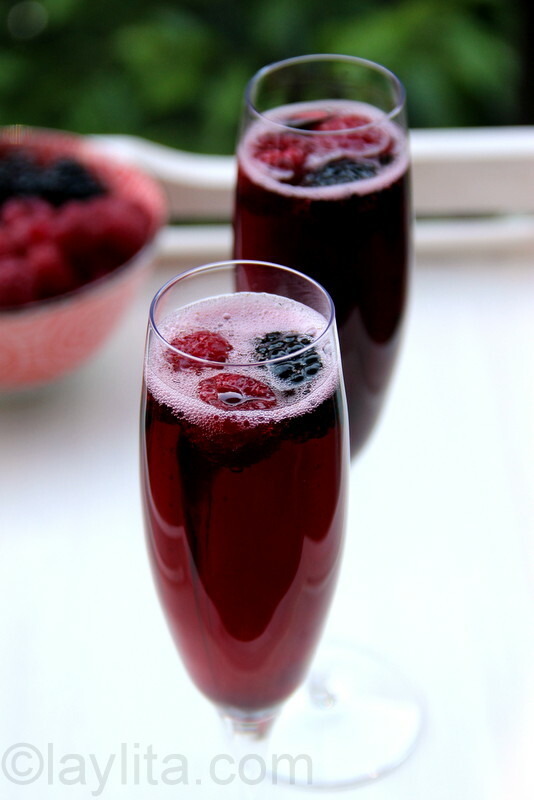 Pour the crème de cassis or blackcurrant liqueur into champagne flutes. 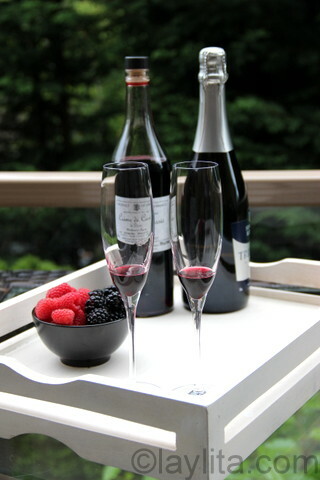 Top with chilled champagne or sparkling wine. 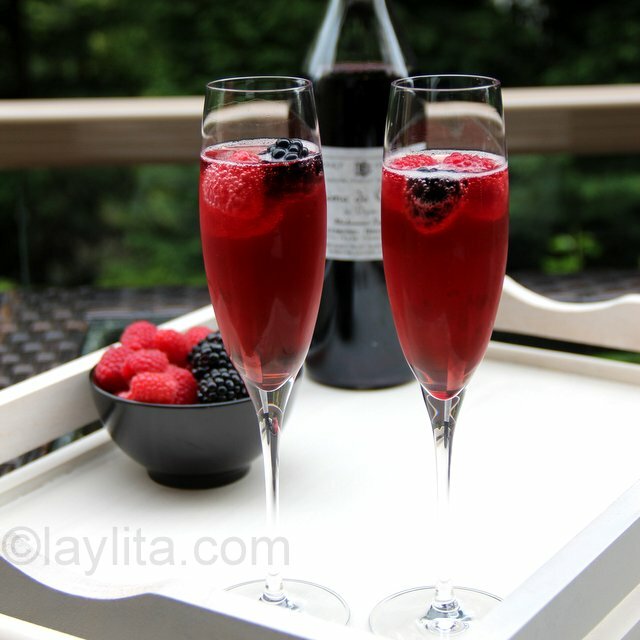 Garnish with fresh berries and serve immediately. I like experimenting with different cocktails, putting spins on classic drinks or infusing liquors with interesting flavors. However, some days all I want is quick drink after a long day at work or something simple, quick and delicious that will work for large party. 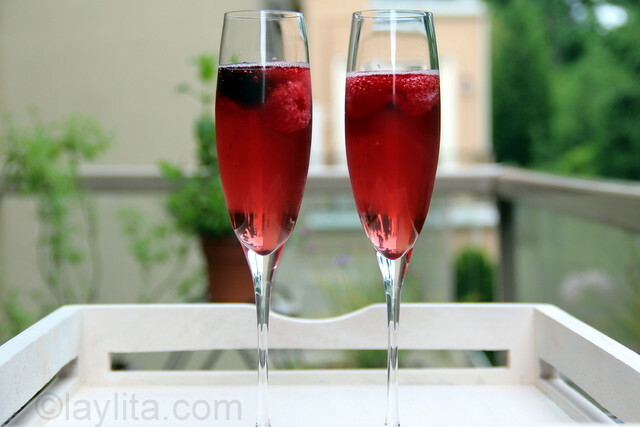 A kir royal, or even a simple kir, is a great option for those occasions. I love champagne or other sparkling wines such as cava and prosecco. I usually keep a bottle in the fridge; you never know when you might have something to celebrate! I also stock up on the half bottles or mini bottles of bubbly. It’s great for those occasions when it’s just my husband and I, and we want to have some bubbly without having to worry about finishing the whole bottle (on a side note he claims that if you put a spoon into the champagne bottle it will keep the bubbles in). The mini-bottles are also great for bubbly cocktail experiments. 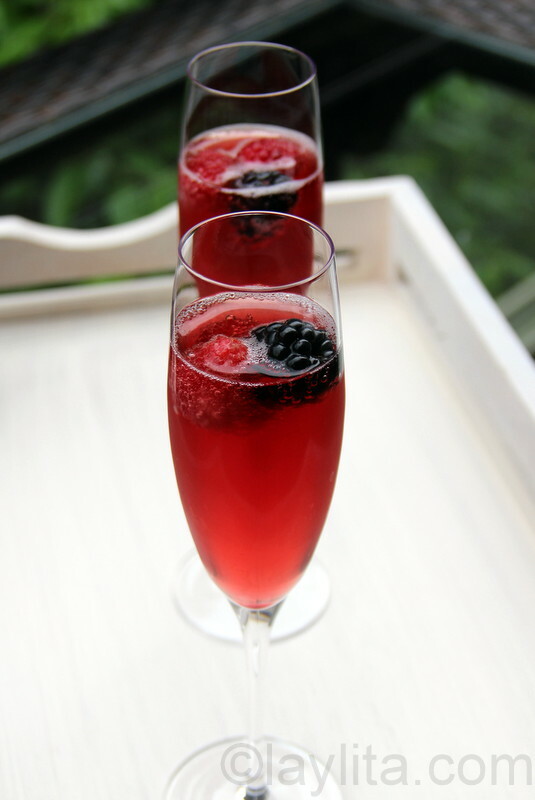 To make the kir royal, I usually use about 90-95 ml of champagne to about 10 ml, a little over ½ tablespoon or less than ½ ounce, of berry liqueur for each drink. The sweetness, color and concentration of crème de cassis can vary from one brand to another. It’s always a good idea to do a test and find out what the best ratio is based on the liqueur you are using, and also based on your preference. A kir shouldn’t be overly sweet, but some do like it slightly on the sweeter side, while others like just a hint of the berry liqueur. This looks just beautiful! What do you do to make your food photos look sooo make me want to have a dish right now? Now, I know your hubby is from France, but… I remember learning that a Kir Royal is made from sparkling wine from Burgundy and usually using crème de cassis, while Champagne and blackberry liqueur is a Kir Impérial. And while I’m at it: white Burgundy and crème de cassis = Kir (just Kir). But I am not from France so what I may have learned the wrong thing. Hi Marie – You might be right, I think the naming has become more generic and simplified. Anything with bubbly is “______ royal” (Mojito Royal cocktails were very popular recently). And every time I’ve ordered a regular kir, I get asked with which liqueur flavor I would like it. 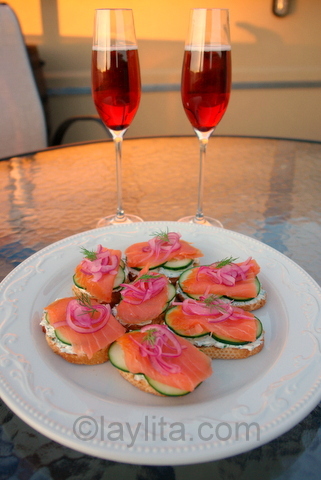 They look wonderful and everything looks su muh better when photographed outside…those salmon tapitas goes great with the Kir..Salud!